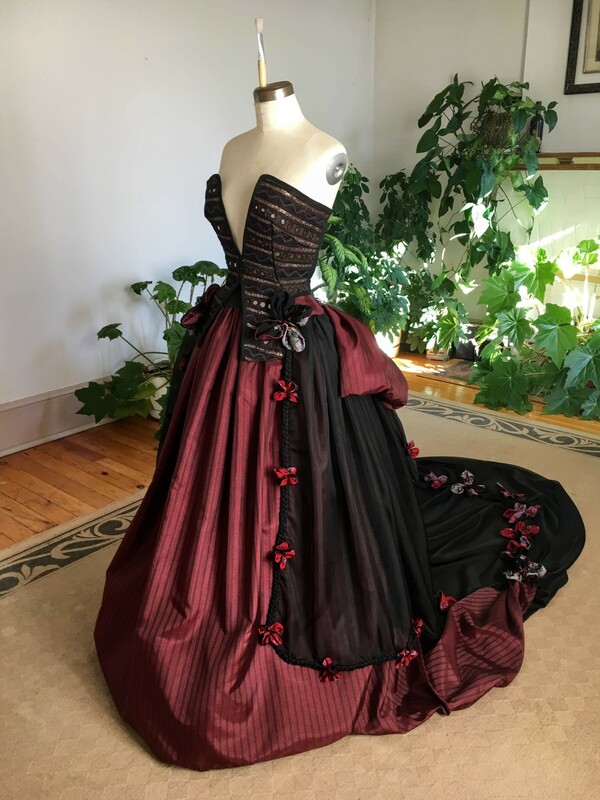 Could I create an Art Gown, who is both romantic & castle worthy? I turned to romance novelists Shehanne Moore & Carolee Croft, and castle photographer Inese. This Art Gown is dedicated to them. They are as gorgeous as the Contessa Fiori. My fave fabric shop had a going out of business sale. (boo hoo!) I bought black curtain sheer for $1.00/yd. & a men’s suit lining for $0.75/yd. 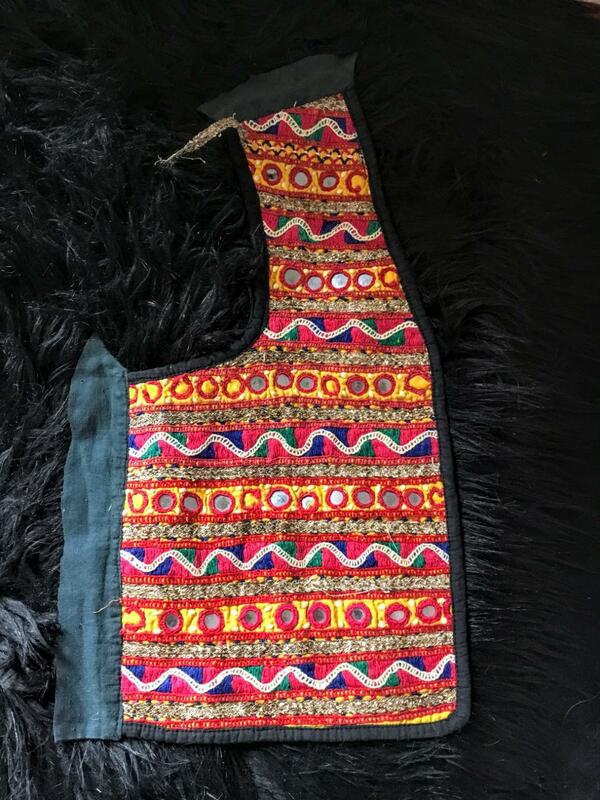 However, the challenge actually began when a friend gave me an East Indian vintage vest (with inset mirrors) and part of a collectible saree. I took apart the vest, & over-dyed the fronts black. 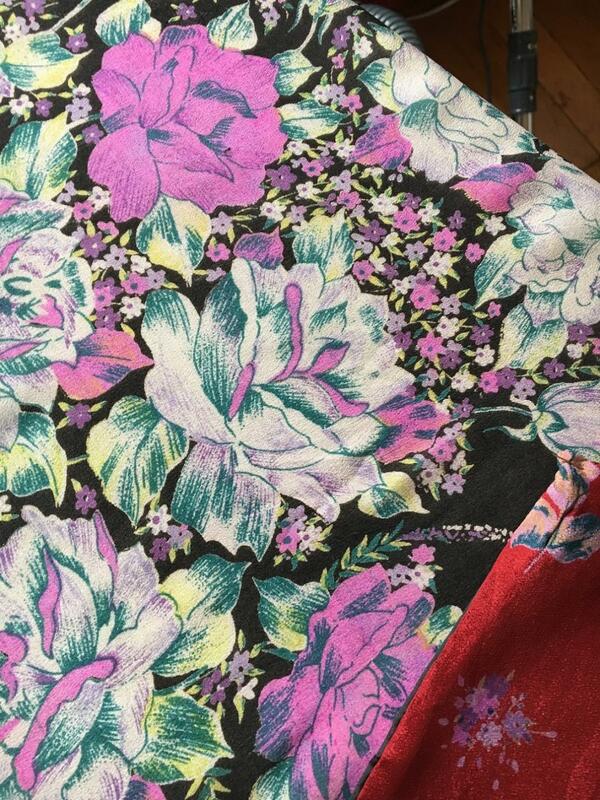 The saree ran from a red floral print to a black w/floral print. Cut into squares, 10″x 10″ & 4″x 4″ they were backed in black curtain sheer, & bagged out. The squares were gathered from the centre out to all 4 corners, forming the flowers. Torn strips of the sheer were braided, and used to trim the sheer side panels. The bow pieces, forming the bustle, came out flat. They were stuffed with used bubble wrap to fluff them out. It was about then that Mini-Me told Contessa Fiori about the castles in Ireland. To visit Inese’s post about Kilkenny Castle, click on pic. Well, the Contessa began to dream about how perfect she would be for castle life. Contessa Fiori told the other Art Gowns about castles, & showed them pics on Inese’s blog, where you will see more than castles. Visit Inese’s blog by clicking on pic below. When I told the Art Gowns I was definitely not buying them a castle, they all got in quite the huff. The Contessa strew her flowers all about herself. Contessa Fiori & Mini Me thank all for visiting Art Gowns. After the photo shoot, Mini Me sulked in a corner. She claimed her outfit wasn’t perfect. Oh my GOSH! Stunning Resa! I think it’s important to go through the steps, as there is so much up-cycling and repurposing and using of fabrics no one wants. I want people to know that the Art Gowns are “green”, in a way, and that beauty can be created from anything. Resa, your Contessa Fiori is indeed both regal and romantic! I always love to read your step by step guide and marvel. You are amazing! Shehanne and Carolee are great authors and possibly secret time travelers. 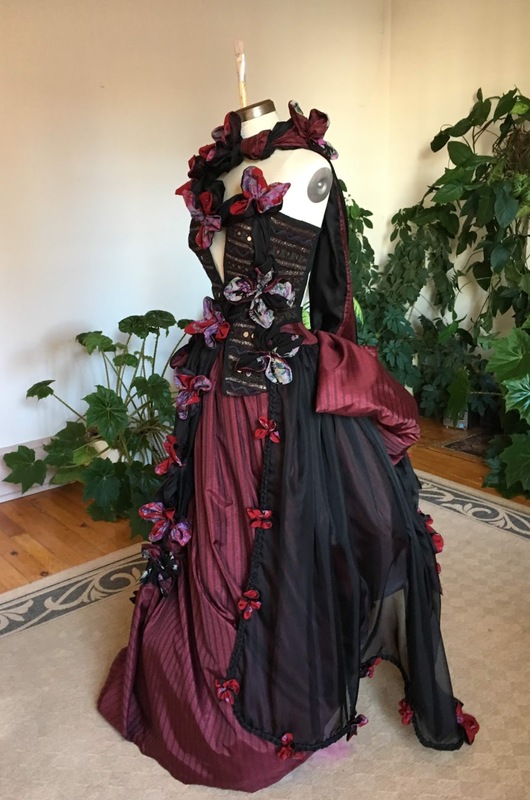 I can see how their books inspired this gown. Hope many more creations will follow. Your castle shots were perfect for this post, and I can’t thank you enough for helping me to write a fun post! 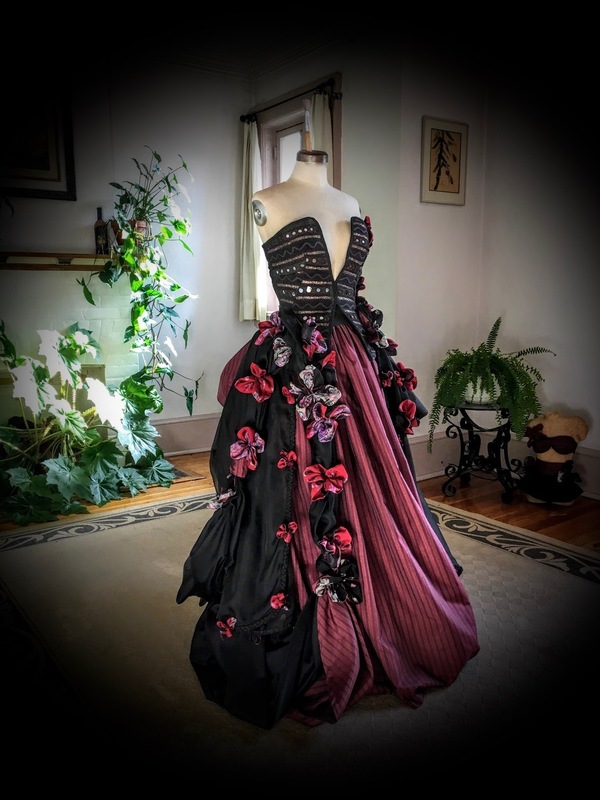 Shehanne and Carolee are wonderful romance writers, and this Art Gown is a passionate one. Thank you, Timothy! The Art Gowns have become quite a passion for me, and I’m so happy you come to visit them! Ode to the Contessa Fiori: Her beauty and elegance, regal style, gathered up in lush bustles and bows and ties, may grace stone corridors for many a mile, of the finest castles in all of Eire, she catches the eye and becomes admired, Contessa Fiori romancer divine. Resa, you did an amazing job! I’m charmed to meet Contessa Fiori, and she definitely deserves to live in a beautiful castle. 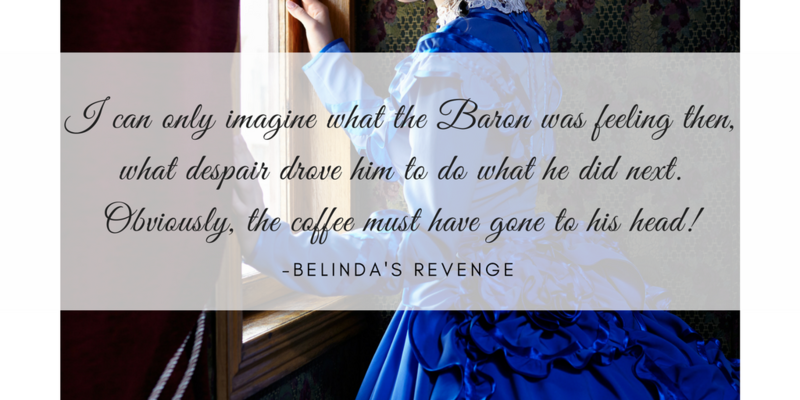 That naughty bodice is to die for! We are all in good company, here. It so great having you girls share an Art Gown with me. Haha, you call it a naughty bodice. 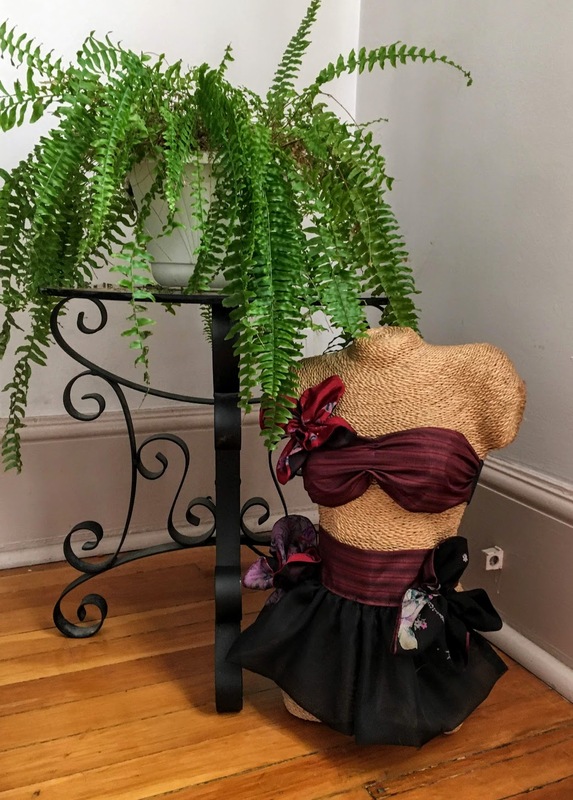 I call it a clever bodice. Seems we are different, in alike ways. Can you believe the Art Gowns actually thought I would buy them a castle? It is both naughty and clever 😉 Definitely a bodice for the ages. Poor art gowns, I know how it feels to want to live in a castle yet be unable to do it… for the time being. Oh, the stories that gown could tell!!! I have a feeling that anyone who wears that gown will be transported back in time. Lovely, Lovely, Lovely. Egads, I may have inadvertently invented a time machine. One just dons the Art Gown and is transported to that era. Brilliant! Thank you, Rebecca! Yep. Gets my seal of approval. 9.5/10. Minus 0.5 for the lack of profanity. But you can make up for that on my siggeted next thing – the Git Gown. I’m aware of the typo, FYI. I have informed my team and we’re working out what happened. What type-o? OMG! Is your team okay? You haven’t banished them to Santa’s workshop, or such? Have you? My team of underpaid fools who help prop up Professional Moron. They leave in fear, they do. I am something of a tyrant. Perhaps you should lower their wages? An exceptional suggestion! I’ll also fire two of them for a laugh. You are welcome, and get that pin out of the back of your throat! You could swallow it, you know? It’s been a fun post, and we WILL do something else in the future! This gown is absolutely incredible. I love the fabric and style. the strip in the skirt makes if for me. It’s just perfect!! You have outdone yours die, if that’s possible. It’s gorgeous and so very creative. Congratulations Resa…another gift to all of us. It’s a very Zen creative space working on the Art Gowns. Yeah, I like the front swath of skirt, as well! As you know, being creative is very satisfying. Thank you for your kind words, and I’m so honoured you see it as a gift. Much love! Castle worthy? 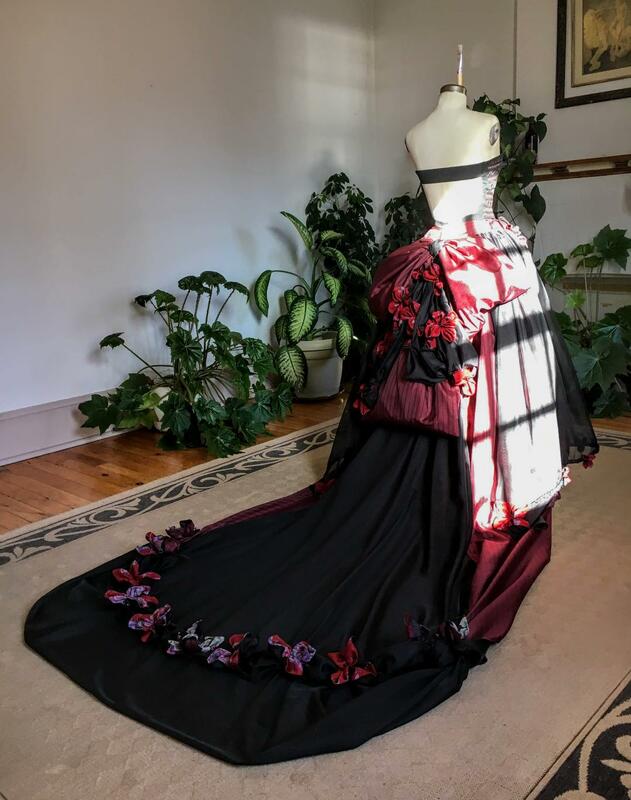 ALL Art Gowns are castle worthy Resa! I only wish I were a Contessa so I could wear them all! Castle ready indeed, Resa. Romance, elegance, timeless beauty with a dash of sexiness – and bubble wrap! What a journey you’ve had with this one. 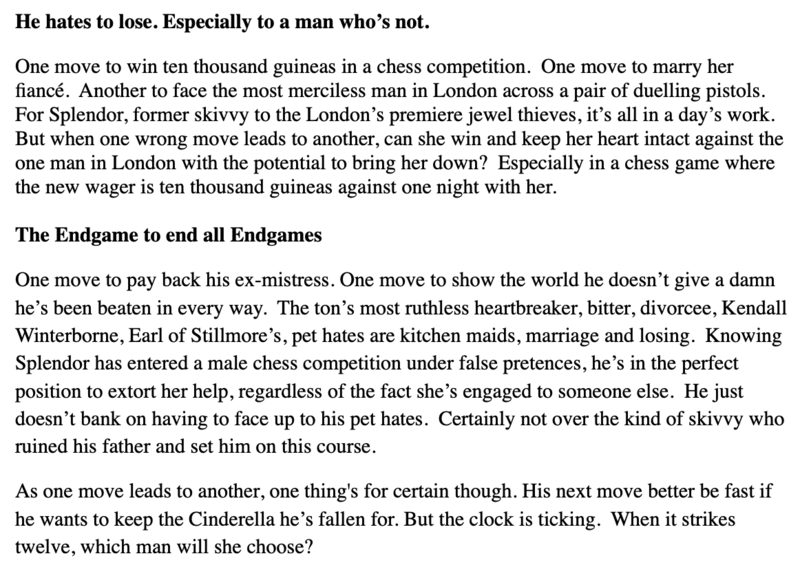 From beginning to end, a twist here and a turn there – something not unlike a castle photographed by Inese, or an engaging novel written by Carolee and/or Shehanne. You’ve done yourself, and them, proud… just beautiful. Thank you for the lovely comment, Carolyn! 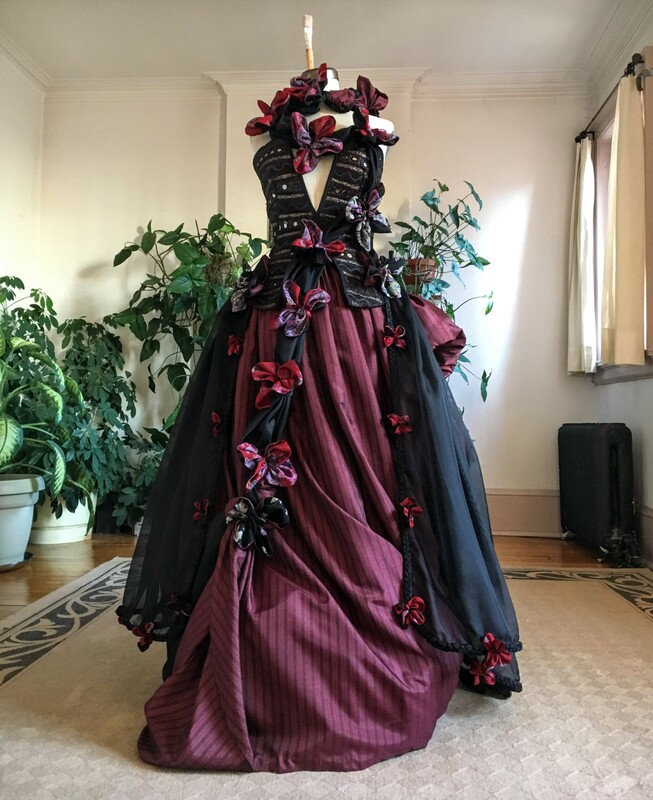 Yes, this Art Gown is a lot of elements coming together: repurposing, up-cycling, using up unwanted fabric. She really is very modern, in an old fashioned way. It’s a lot of fun working with Inese, Shehanne and Carolee. The Contessa Fiori was not a woman to be taken for grated. Or worse – ignored. The castle may be a bit drafty but tonight the ballroom would be lit with the candles of a dozen crystal chandeliers. Her maagnificent gown would outshine all others. The decolletage would draw all eyes, but there was one man in particular she had in her sights.. Head high she made her entrance. The music played. The dance began. She was a success. I adore the way you always see a scene, a story with the Art Gowns. You enrich their beauty by giving them romantic and dramatic breath. You can’t grate a Contessa but she will not be taken for granted. LOL! Normally I might correct a typo in a comment, but this is just too, funny. Luv it! Eco-friendly, that’s the term I was looking for! 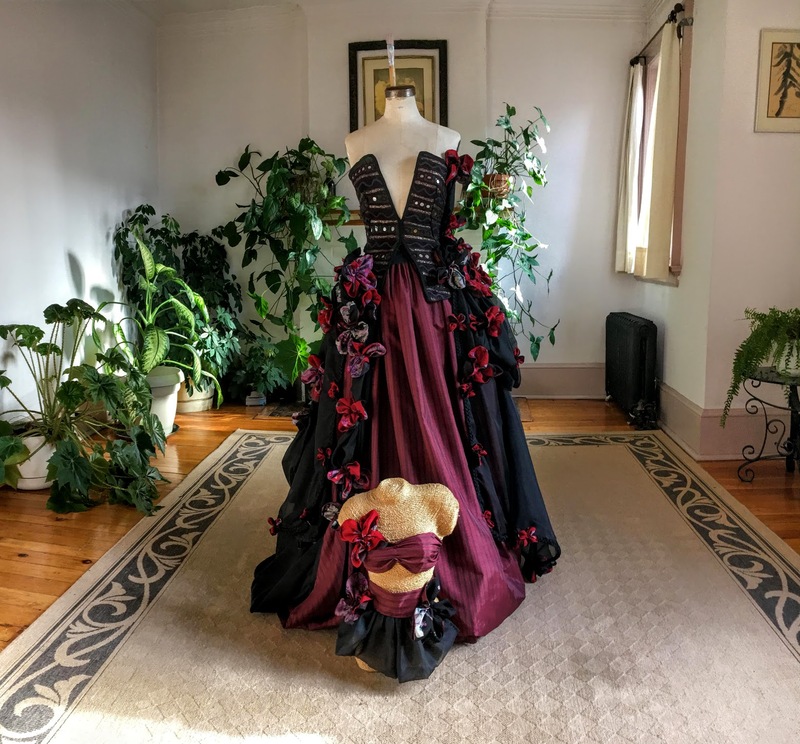 As I have always made the Art Gowns from bargain bin fabrics and recycled/upcycled materials, The Art Gowns have always been eco-friendly to a point. Contessa Fiori is the zenith, at the moment. Truly stunning! I love how you repurposed the Indian vest. Thank you, Cheyenne! I was very excited about the vest. Once I had over-dyed it, I could almost see the entire Art Gown. Your art is very gorgeous! Thank you! 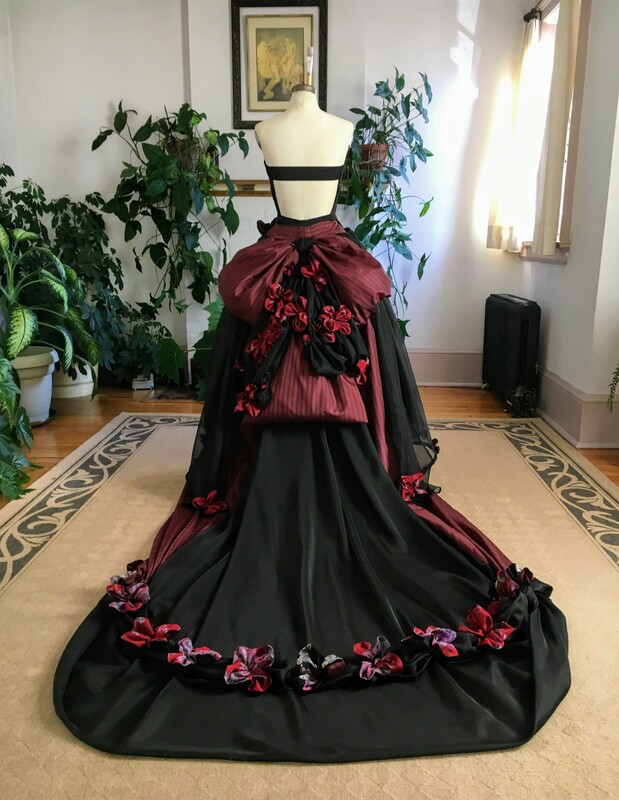 Another wonderful art gown my friend. Definitely castle worthy Resa. 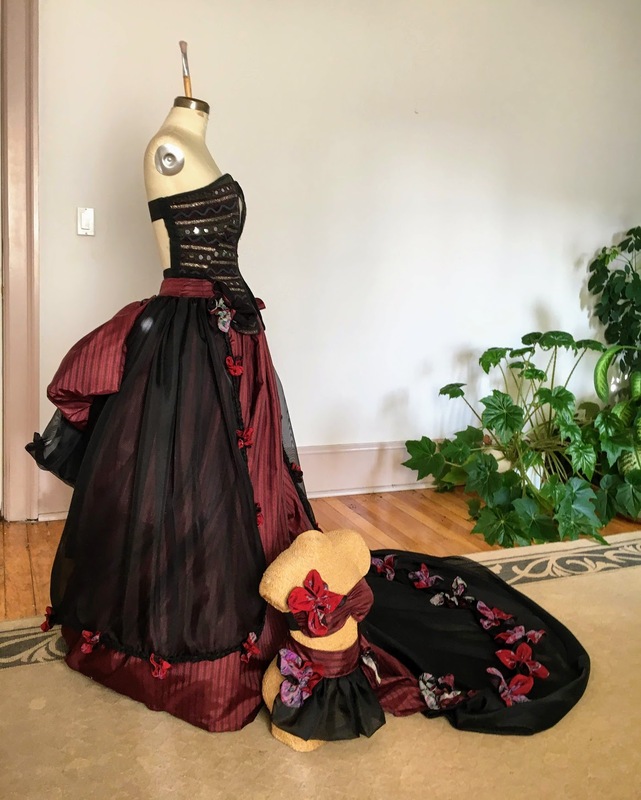 Beautiful dress, and love how you made it too! Thank you! You have a nice blog, too! I did visit. Contessa Fiori & Mini Me … both are really dazzling, … let the dance begin! Each new ArtGown surpasses the previous one in creativity, this is an impressive design, it’s so beautiful. In addition, (this is not so important but it matters) you have achieved a work of art through recycling, the budget is very small and the results are amazing. Congratulations dear friend, I am excited to see the dimension that your art reaches !!! Sending a lot of love and my sincere congratulations, I think it’s the best … or one of the best ArtGowns you’ve designed. Thank you very much. Yes, the Contessa is very eco-friendly, and for very little money. It is the time I put into the gowns that is more precious. I always think, “this is the best Art Gown I have designed”. I adore them all. I have 21 Art Gowns, now. Mystic Lake is a true beauty, just like you! Mini Me sends her love, and thanks you for the compliment. I have promised to make her a better gown next time. Mini Me is the Art Gowns’ muse. She is always complaining that the Art Gowns have better gowns. She is a very spoiled muse!! Sending Mucho besos y abrazos! You’re right, time is very difficult to value, it’s the most important thing. Sending love for the whole family!!! Are you kidding me? This is GORGEOUS. 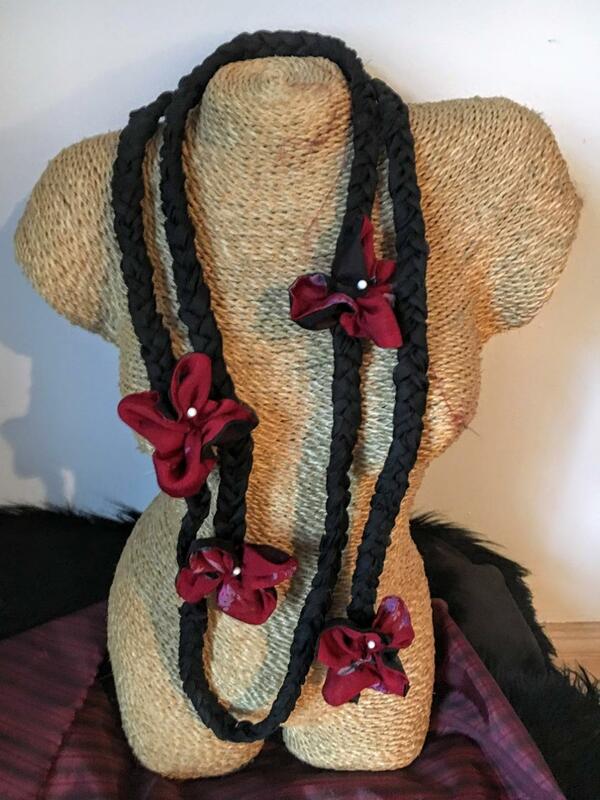 I would love to see my lady wear this, well, if I had one. Aww, thank you, lonely! My personal art is an odd one. Three months. That says a lot about you to have the patience and preserverence to create these works of art. I really adore them all. I would say, the more recent they are, the better I have gotten at making them, and presenting them. Lady Anne is my fave older Art Gown, and Flora Blanca. I’ll stop now before I name all the older ones. Yikes, it’s a bit like picking a fave child! Aww, don’t be sorry! However, that is very sensitive of you! Haha I was challenged to model one, about a year and a half ago. I’m older, so it took a lot of guts. Thank you dear Aq! Your comment is most appreciatively well read, and thought out. Love the comment and love you! They are both perfect and would look good in any castle. Although the castle would need to have lots of heating to keep them warm. 😉 I hope you can find another good source of fabric. TY, Gallivanta! Heating? Oh dear, the Art Gowns don’t know about that, yet. They are Canadian Art Gowns who think the best of the world.That means central heating. The Contessa is fabulous, Resa! The fabrics and the colours are wonderful and the design is perfect! Thank you very much, Claire!!! Resa. 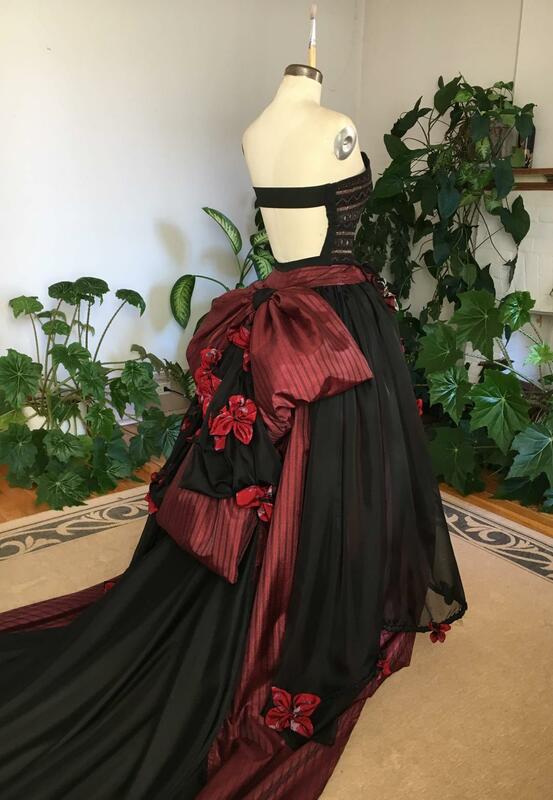 This is just, Sooooo beautiful… Oh what a bargain of material.. What a great find.. especially waiting for your hands to create this magnificent gown.. So loved the story you weaved between and showing how the bodice was constructed.. The Castle images just lovely..
Contessa- Fiori is a proud member to join the elite class to join the Ballroom in her dance. Sending LOVE and well wishes.. Thank you for you fab comet comment! The Contessa was a joy to build, and now does a Ballroom dance for you. Well, you know how much work goes into 1 of my girls, so I guess 4 months to the next one. Yay, after the holidays, I’ll be doing “Art Gowns Art” etc. updates. OMG OMG OMG!! How have you managed to get SOOOO many talents all in one life, Resa? This gown just blew me away! Have you sold any that you have made? Are you making a name for yourself, a name VERY well deserved? I am stunned just stunned by what I just viewed. What an incredible woman you are! BRAVA!!!!!! Amy! LOL, and omg to you, too! Your new Gravitar pic is sensational. It really says lots about what you love doing. I hope you do not replace this with a beautiful flower any time soon. You look, too, good. Yes, my Art Gowns mean a lot to me. I think they are my main talent. Thank you for your enthusiasm & support! gowns for art’s sake and not as clothing, but it’s what I enjoy the most in life. And you do it WONDERFULLY! Sorry that I am late to the party, this is really worth the wait though. You are so talented and that gown would certainly fit perfectly in any fancy castle or palace that it graced. There’s no late! There’s just here. Glad you got to see my girl! I’m so happy you love the gown, and I think you’re right about it looking fab on stage. Not everyone gets to sit close, and I find overblown/overstated designs hold the look right to the patrons at the back of the theatre. The mirrors were not a problem, as they do not absorb the dye. 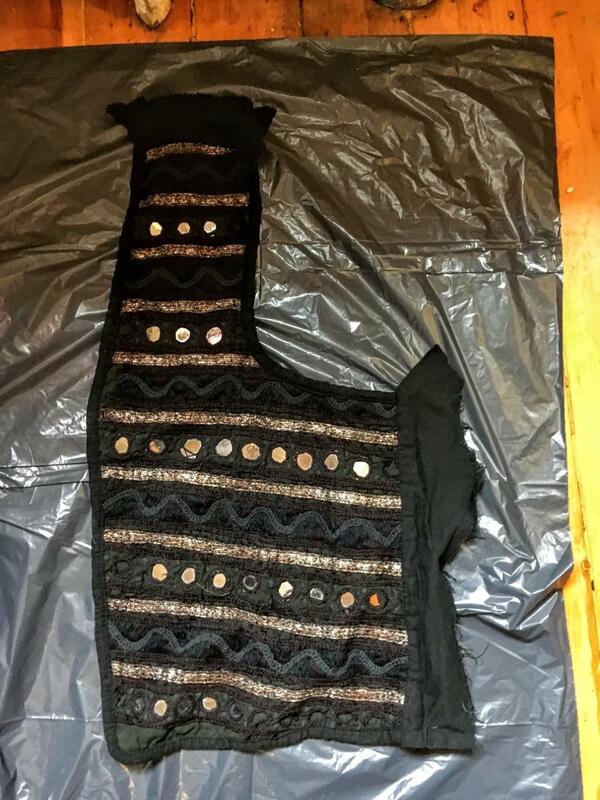 The crazy thing is; this is a vintage vest, and they used real mirror back when. I have reason to go to little India for work, once in awhile. The quality of the traditional sarees, etc. is not what it used to be. The mirrors are now like a mylar. Although the mylar would not absorb the dye, it would become clouded. I had a wonderful Christmas, and I know you did. 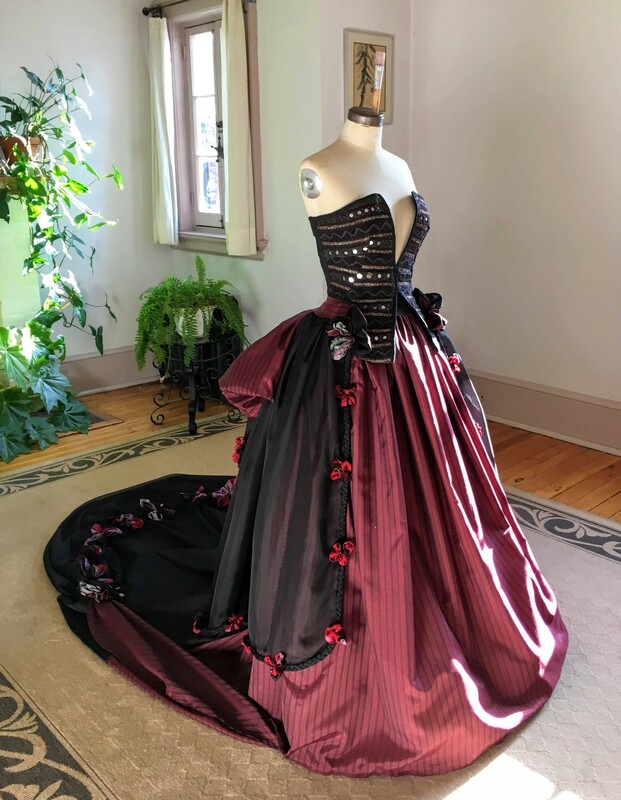 This gown is fabulous and so creative…as always! Happy New Years! Thank you! Hope all is well in book land! I was very moved to see my Pupkin reading a book! 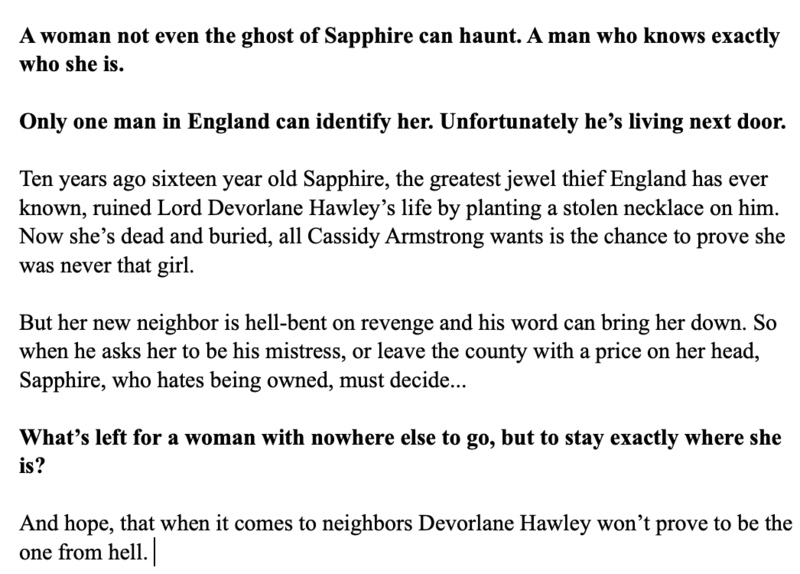 I’ll reblog it on my writing blog, as soon as I get back to it! Beautiful, as everything you do! Thank you, Maria! Much appreciated! So awesome to see another of your creations Resa, missed you. This is another stunning piece of art – your gowns are exquisite. Love this and the story, they blend perfectly. The back and bustle are amazing when looking closely at the detailing and how it flows outward. Wonderful work – Happy New Year! Oh, I am so happy you got to see this Art Gown. I’ve decided to do art renderings of all my Art Gowns, in retrospect. I hope you will like those, too! Okay! So, you & Cecilia will be 3. I’ve got Ballroom Lux, then O Royal Treasure, then Cecilia! Ooooh Resa ❤ Such incredible talent you have!